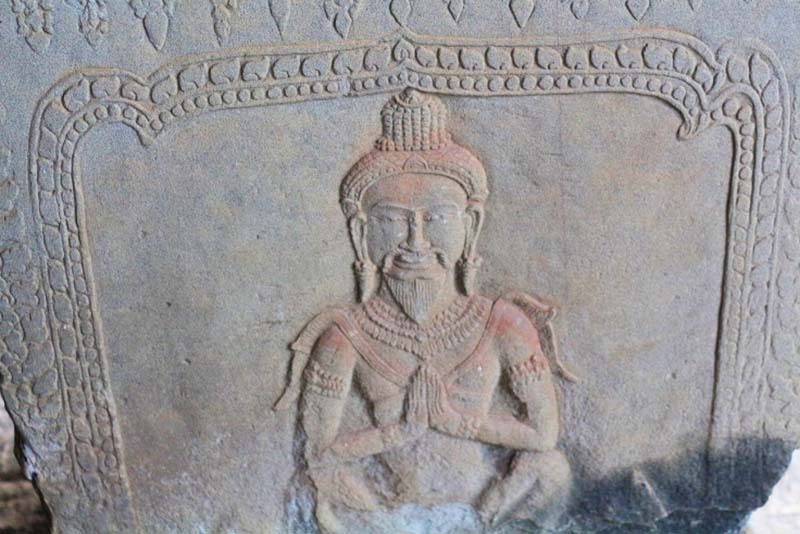 This post is in continuation with a previous one and part of my Cambodia Travelogue. 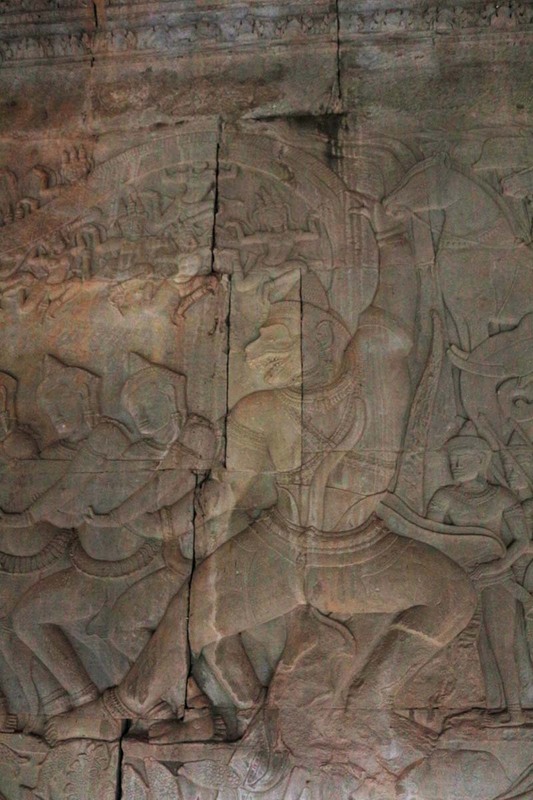 Details and pictures below are of the several temples that we visited at Angkor Wat on our second day in Cambodia. To read the previous part of this travelogue, please click on the link below. 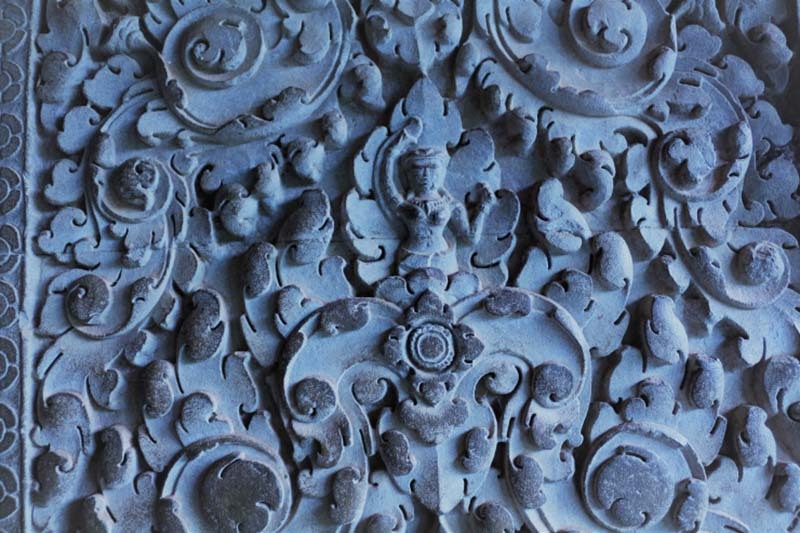 Most Western guides say that you need at least 3 days to appreciate the temple complex. They will also warn you against the oppressing heat of the noon sun; which is, in fact, true indeed. But rather than spending three days, we decided to cover the temple in a day to save time and money. Hence a bit of planning was required before the big battle. 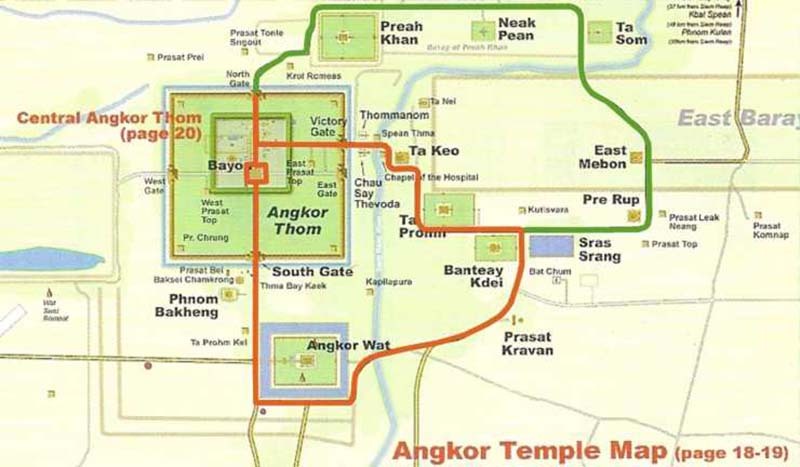 The minor circuit around the temple is the orange one will cost you $15 in a Tuktuk. The major circuit is the route in green and will cost you $18. This can be a bit confusing for the newbie traveler. Our Tuktuk charged us $30 to cover both. What is a Tuktuk? It is a small three-wheeler kind of a deal which is used for public transport and sightseeing in the temple complex. In the words of Prof Michael Porter, The essence of strategy is what not to do. This is the mantra we followed and that would be my advice to you as well. Read on for more details. 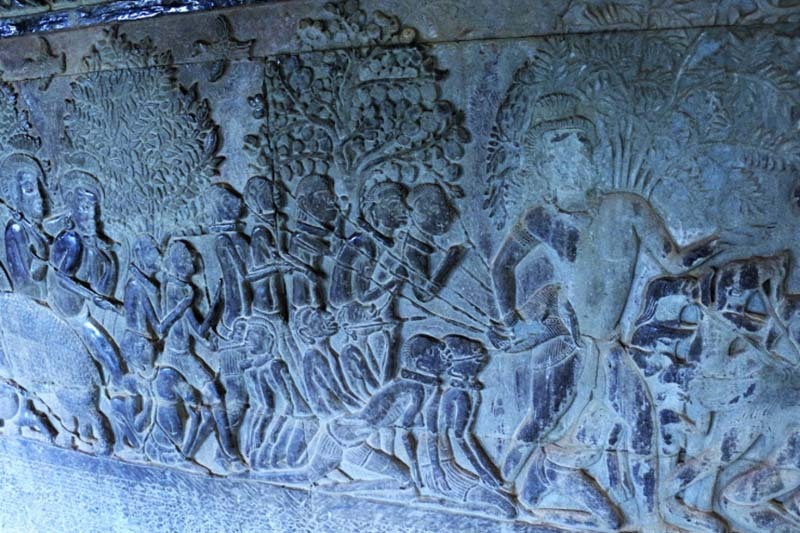 A visit to the Angkor National museum the day before will give you a brief insight about the Angkor temples, the history of the Khmers, the rivalry with Chams and the Indian influence on their history. 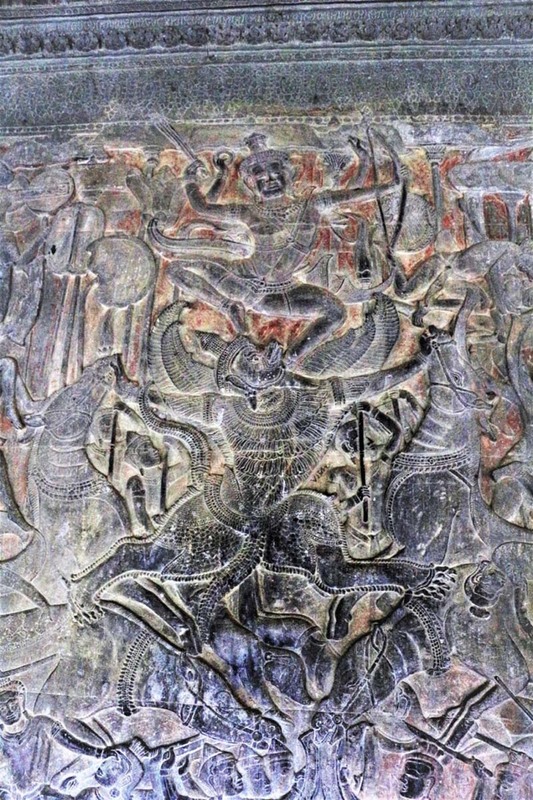 Get hold of a map of the Angkor Archaeological park which is available for free at all hotels. 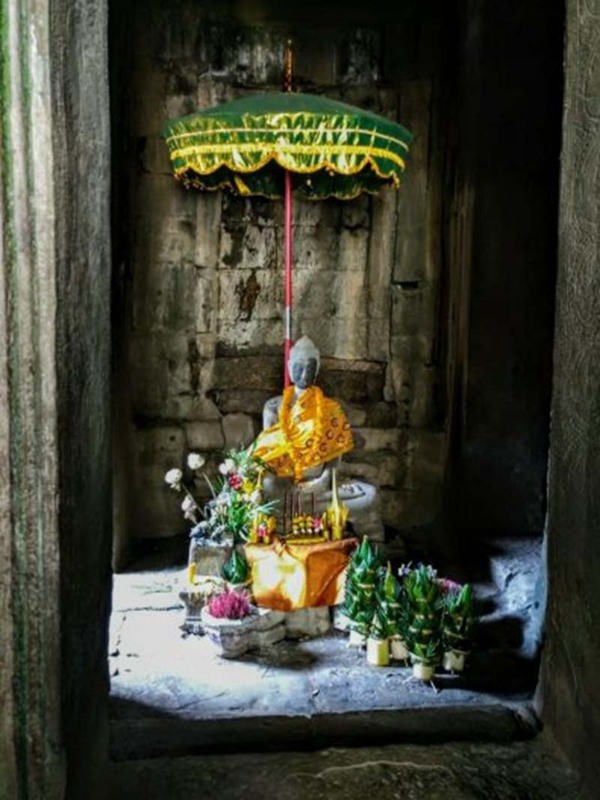 Do your research well, and explain to the Tuktuk driver the order in which you wish to see the temples. Don’t get tempted to see all in a day, you simply can’t. Ask your hotel the day before to give you a packed breakfast; and also carry about 2 liters of water along. Both water and food at the temple site are very costly. Wear clothes that cover your legs till your knees and your shoulders too must be covered. I know it will be hot, but local traditions must be respected. After all, you are going to a temple, not a beach or a pub. 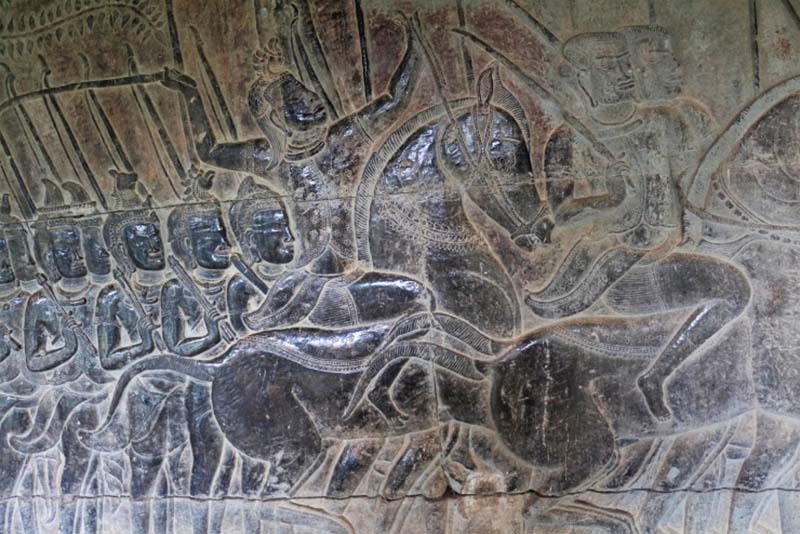 Banteay Srei temple closes everyday at 5:00 PM and Kbal Spean at 3:00 PM. All other temples open at 7:30AM and close at 5:30 PM. For latest updates, you can visit the website of APSARA. And this is how our D-day turned out to be. 4:30 AM: Crinnnnnnnggggggg!!! Ready. Got on the Tuktuk with packed breakfast, water, camera, hat, maps and lots of spirit and enthusiasm! 5:00 AM: Arrived at the APSARA ticket center. The place is sort of a global village. You can find Brits, Germans, Russians, Chinese, and all in complete chaos; sort of like Tower of Babel. You got to make sure that you are standing in the right queue because there are different queues for 1day, 3days and 7 days passes. Smile at the camera and you get your ticket with your beautiful face printed on it. 5:30 AM: Arrived at the parking lot of Angkor Wat. 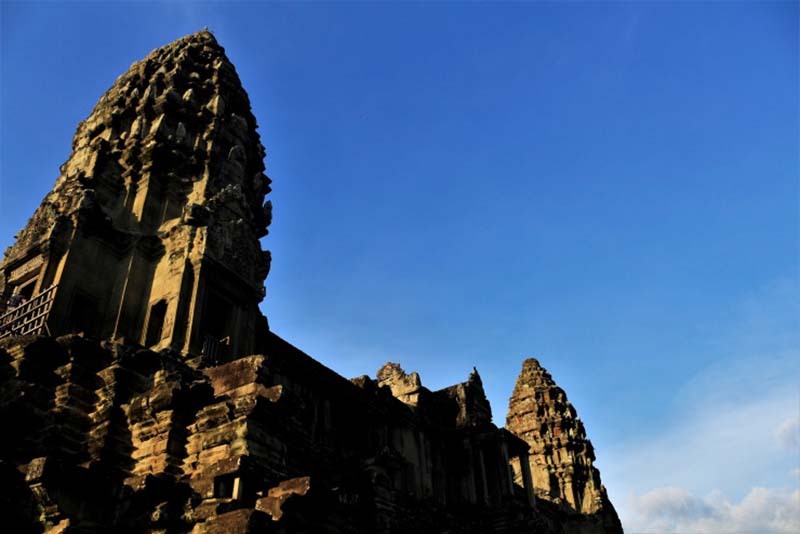 A brisk walk of 15mins and crossing a floating /sandstone bridge across the moat will bring you the Western gates of Angkor Wat. 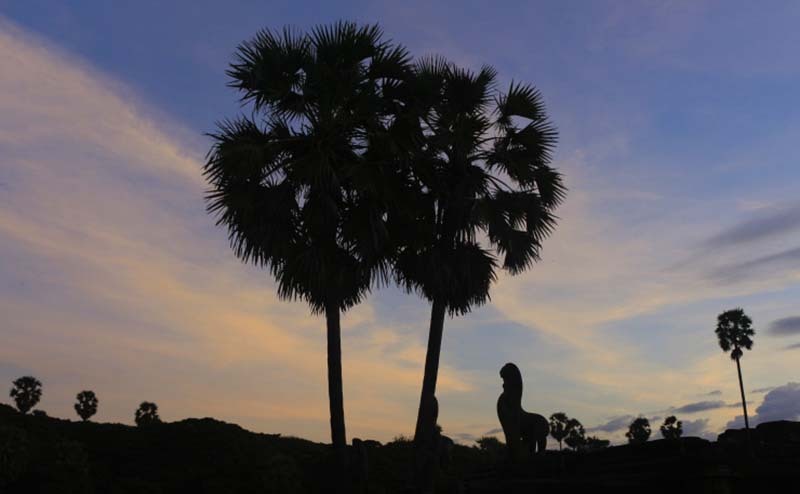 After walking on a paved path flanked by Naga balustrade on both sides, with tall Palm trees for company, you can see the silhouette of Angkor against the colorful pre-dawn sky. 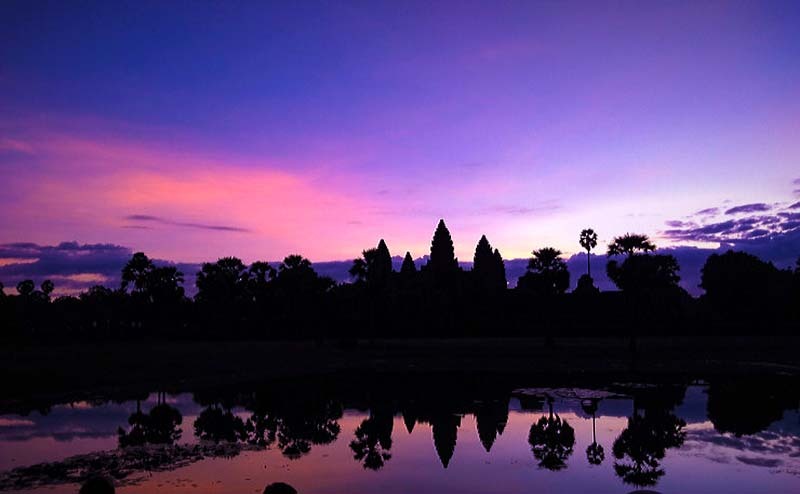 Join thousands of others in front of the banks of the two small pools to get the perfect reflection of the temples, or you can pick up an isolated spot on the staircase to enjoy the sunrise. We did both. I was busy clicking pictures while my wife enjoyed the sunrise. 6:15AM: After the sunrise, most of the folks will be heading for a quick breakfast or to the hotel. 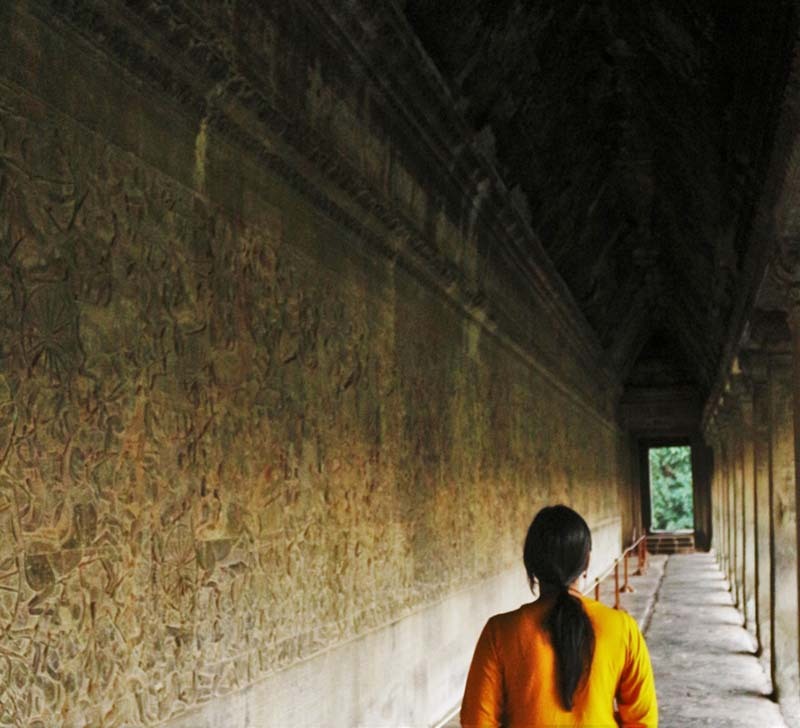 Control your hunger pangs, and utilize these golden moments to explore Angkor Wat on your own, without the crowd. And trust me, it can get crowded hre a bit. 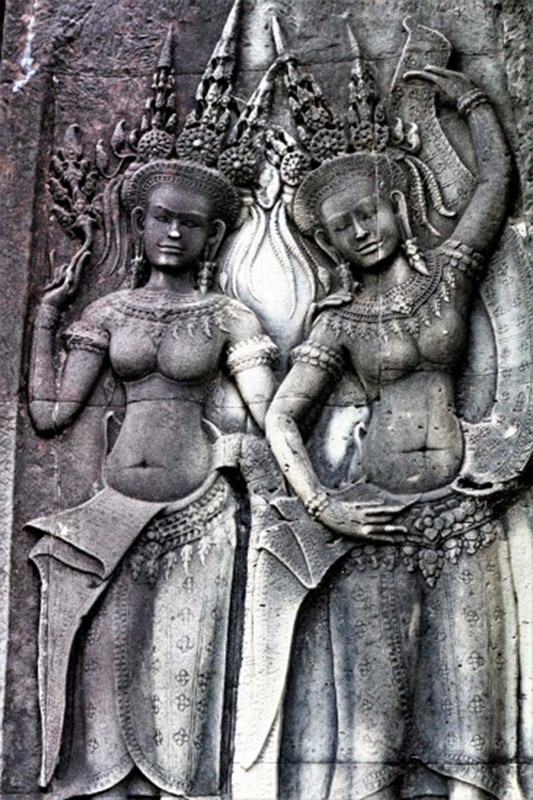 About 2.5 million people visited Angkor Wat in 2017, and the number increases each year. 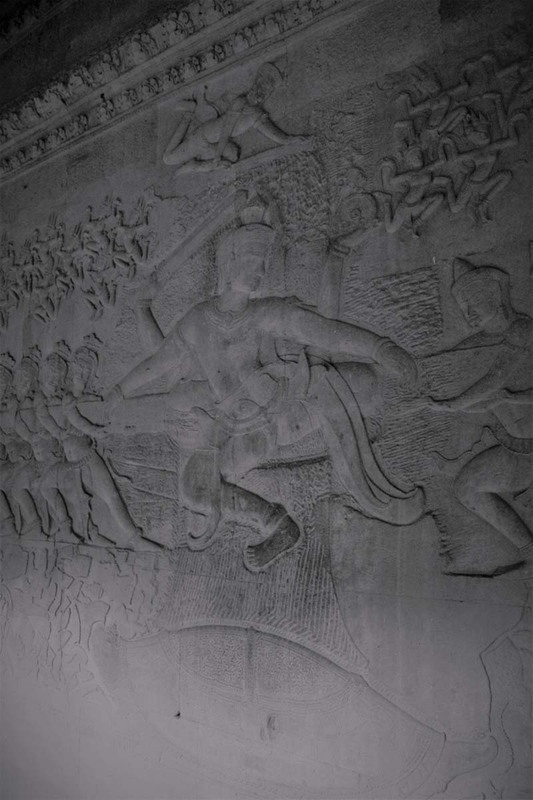 Below is a picture of Angkor Wat against the pre-dawn sky. I shot this picture over the head of a short lady; and it is probably the only time my height was an advantage. Only in Spring Equinox, the sun rises behind the main tower. 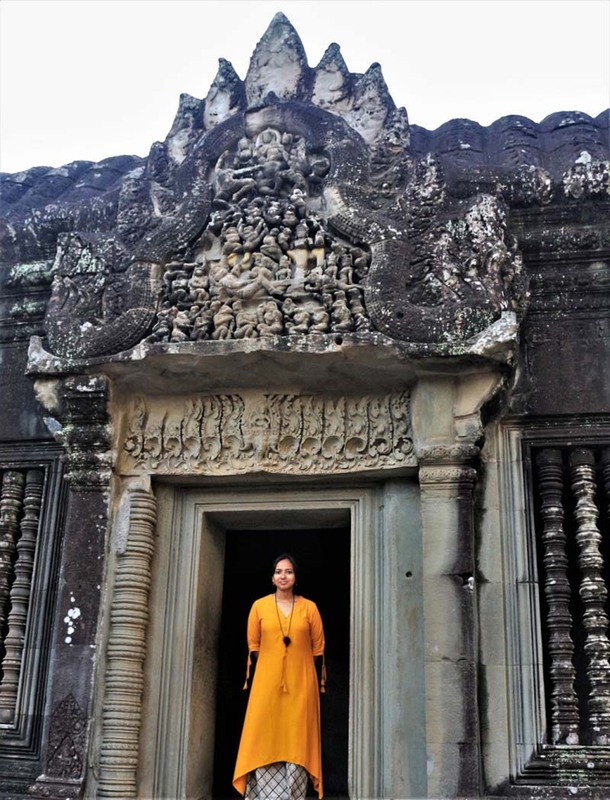 Built by Suryavarman II in the early 12th century as his mausoleum, the Angkor Wat is an exceptional Hindu temple; in the fact that it faces west which is actually the direction of Death in Hinduism. 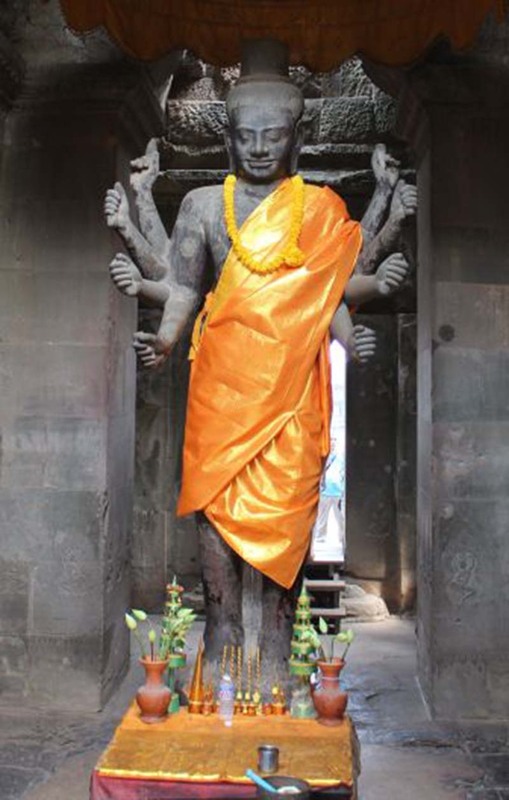 Conceptualized as Mount Sumeru, the abode of Hindu Gods (like Mt Olympus of Greeks), the central tower (aka Paban) used to house the statue of Lord Vishnu, whereas the other four corner towers/gorupas are the abode of other Gods. The temple is surrounded by a wide moat which can make the European castles envy; and signifies the Khir Sagar (of Samudra Manthan). 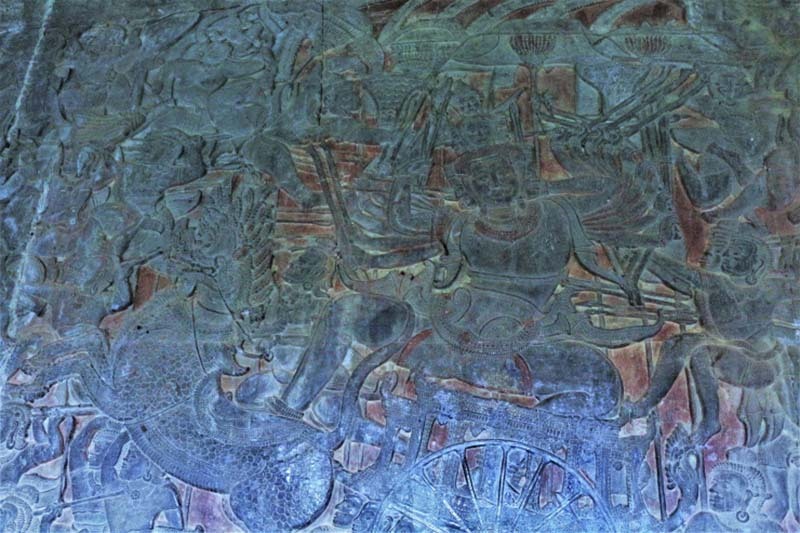 The paved path leads to an elevated cruciform staircase, flanked by Nagas (serpents) and lions. 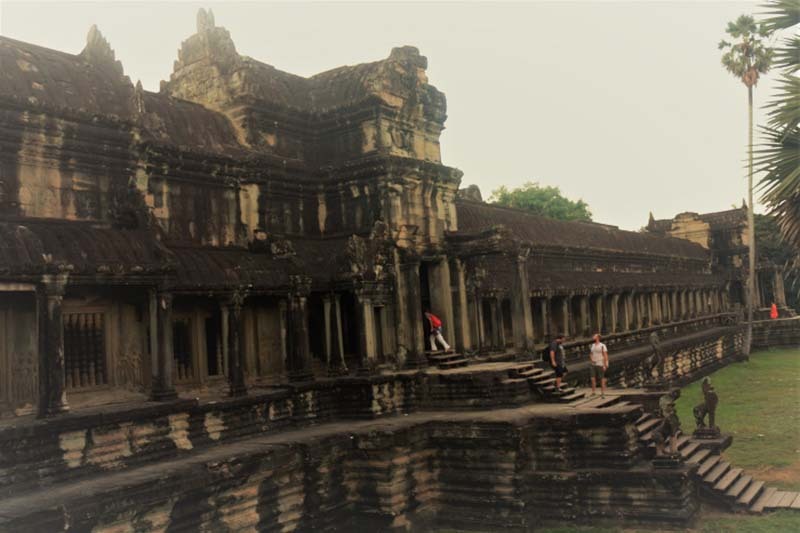 The Angkor Wat consists of three levels/floors. 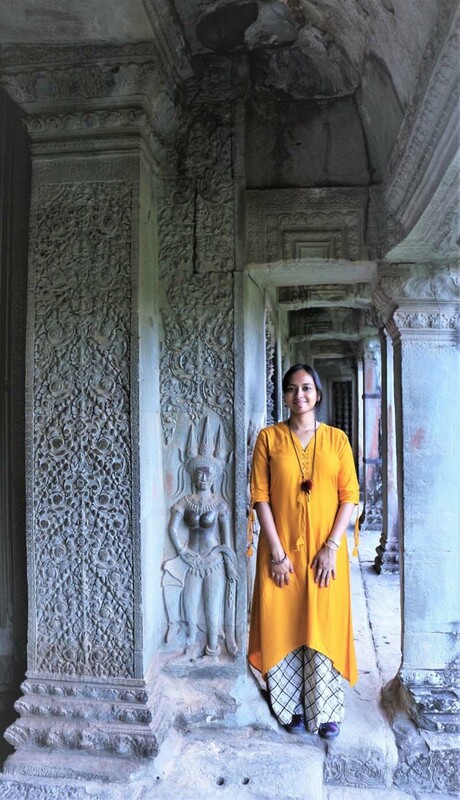 The first floor or the esplanade (to go in a counter clockwise direction) consists of large alleys with intricately designed pillars, and stone murals depicting various themes from the Mahabharata, Ramayana, Hindu scriptures and daily life of Khmer kings. 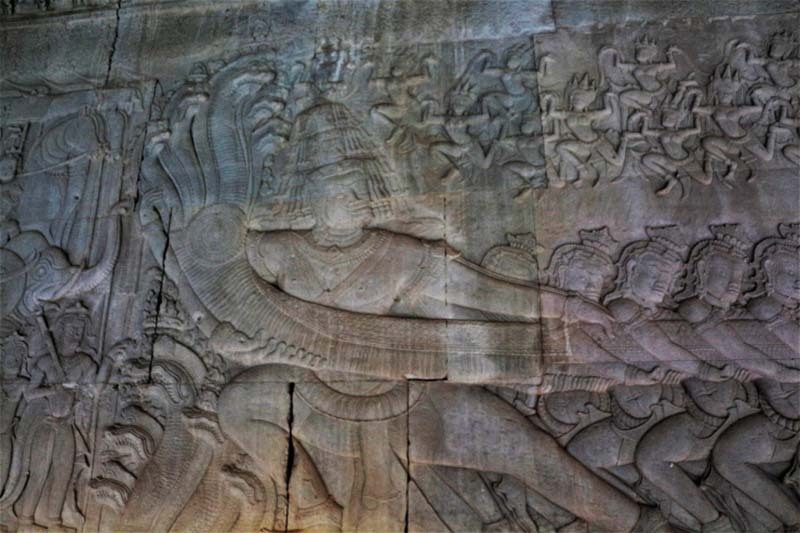 Samudramanthan- Indra and other Devas pulling the tail of Basuki, the serpent. 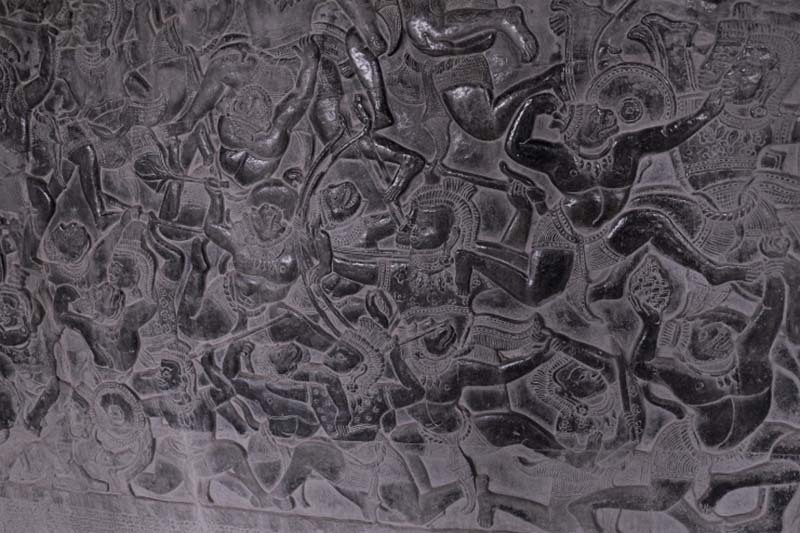 The panel of Samudramanthan- you can imagine the amazing craftsmanship of Angkor artisans, considering that she is standing in the middle of the panel,and an equal length is behind the camera. 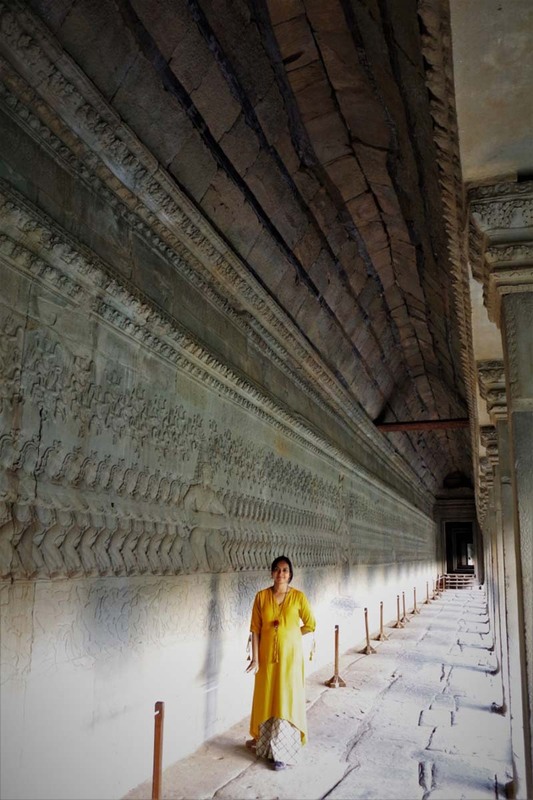 The ceilings used to be decorated with wooden works and the pillars are decorated with figurines of Apsaras. 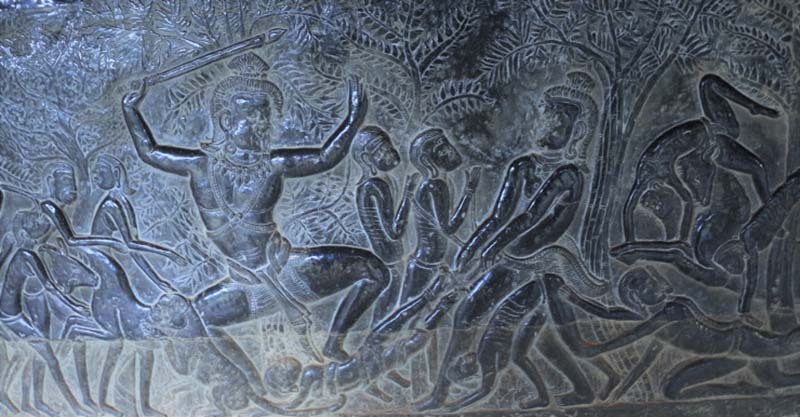 Bali, the Asura king along with other asuras pulling the head of Basuki- a scene from Samudramanthan. 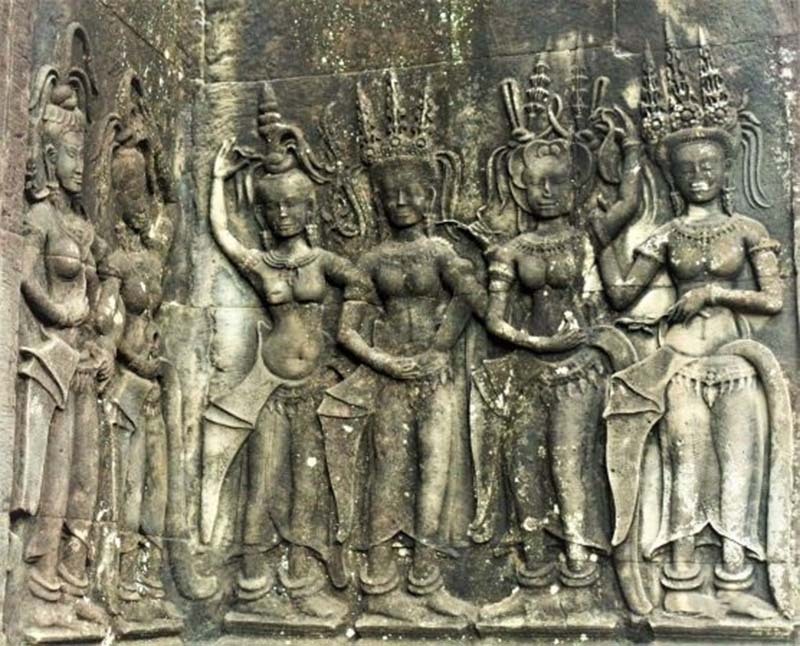 You can see the apsaras cheering at top, may be the first instance of cheerleaders ! 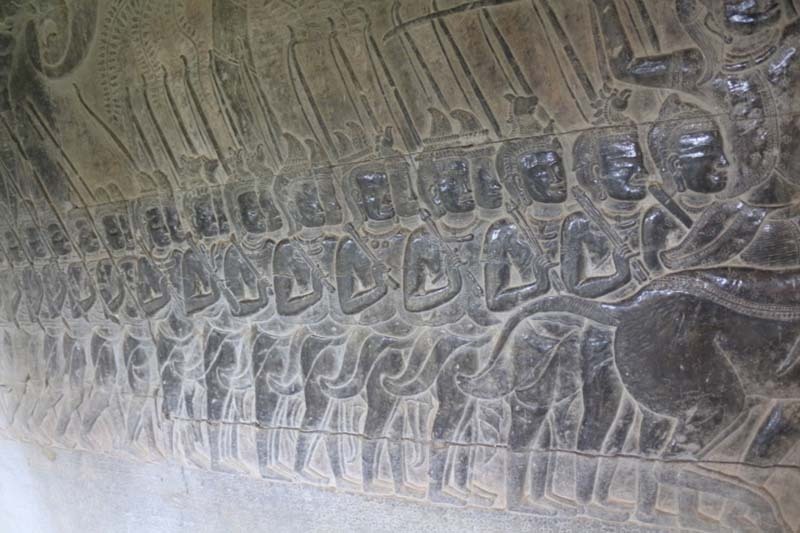 The panel of Battle of Kurukshetra – you need such a long wall to depict a 18 day war! Rishis and Apsaras- note every level is different from that above. 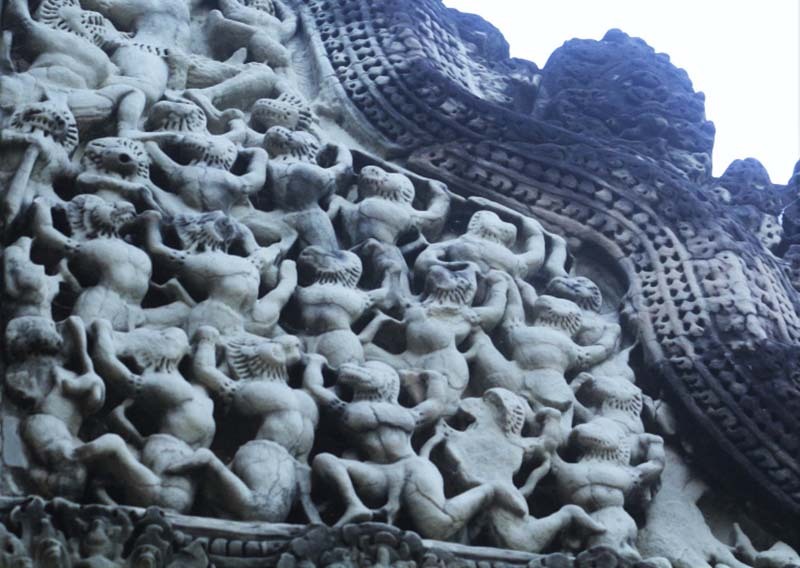 How masterfully the Naga figurines are disguised in the corners of the temple arches! 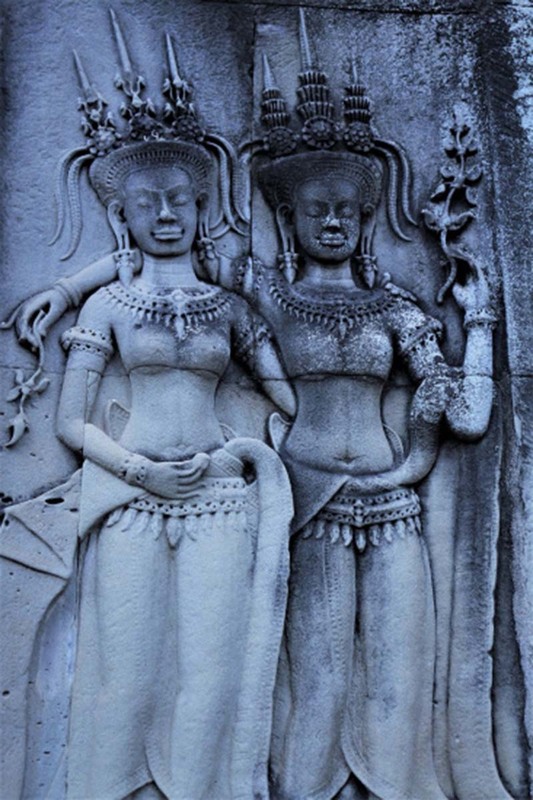 The numerous Apsaras with varied postures, clothes, and hairstyles (37 hairstyles in more than 3000 apsaras). Such variety can give Jawed Habib and Sabyasachi Mukherjee a run for their money! 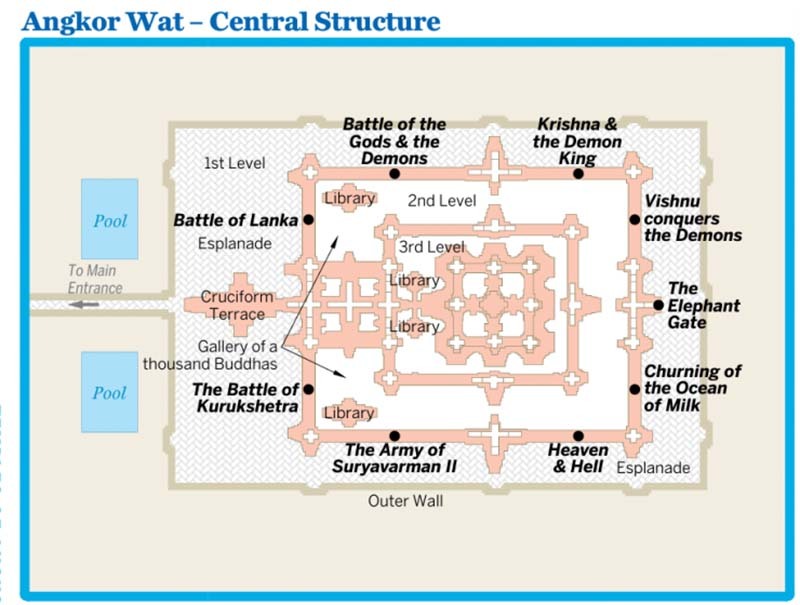 The corners of the second and third levels are studded with 4 towers with lotus bud tops, while the central tower (Makan or Meru parbat, where the deity of Vishnu used to be kept) rises above the four to give the whole structure asymmetry. You can climb to the top to get a panoramic view, however, the steps are steep and you have to stand in a queue. 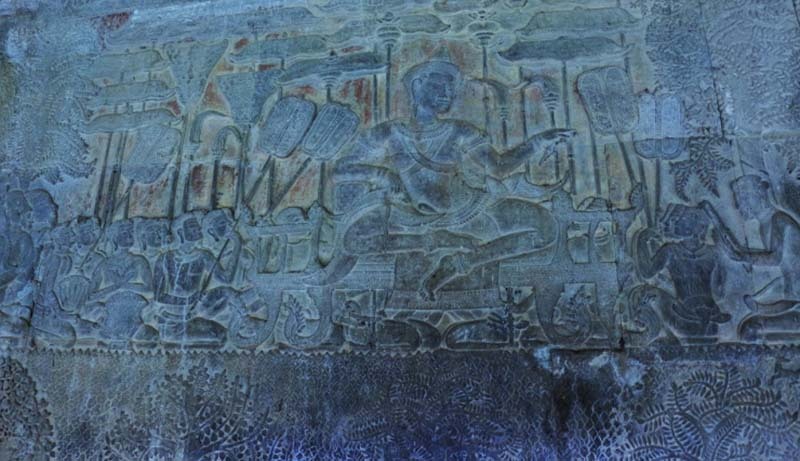 I hope the travelogue and information above on Angkor Wat was of help. 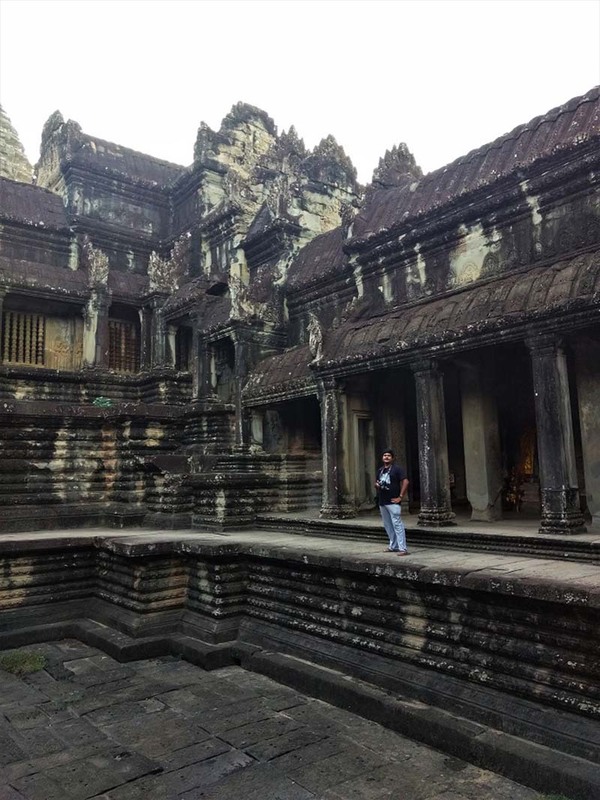 Please click on The Temples of Angkor Wat – Cambodia to continue reading the next part of this article. If you have any questions or need any further details about visiting the temples, please feel free to ask in the comments section below; or at our Community Forum; and I will be glad to answer.